The icons used in the Badge Modules can be moved. While it is possible to upload new Badge icons to achieve the desired order, it's easier to drag and drop. This article explains the steps for Reordering Badge Modules. Select a Badge Module you wish to move by clicking on it once. 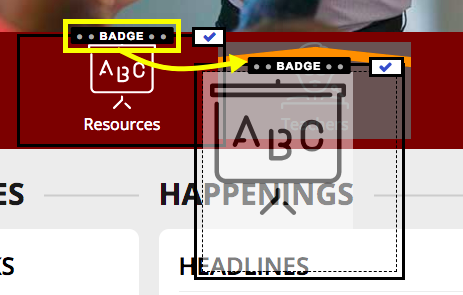 Move your cursor over the selected Badge label, click, hold, and drag to place that badge either above or below the Badge where you want it placed. Look for the orange indicators showing where you will be placing the dragged module. This will temporarily stack two modules vertically. 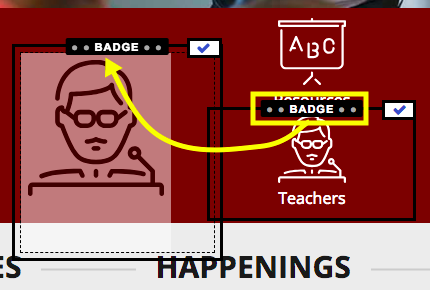 Repeat this process until all your Badges are in the desired order. The Badges are moved to the desired places.